Facebook is a social networking site that allows users to connect with each other. The website helps friends and acquaintances get constant updates on things that matter to them. However, Facebook is not all sunshine and rainbows. Users from the social networking site have reported spammers, hackers, identity thefts, bullies, and abusive persons. Facebook recognizes this bad side of social media and has made security and privacy measures to stop, or at least, contain these abuses. The site has offered their users to choose their privacy options. Users are allowed to block people. 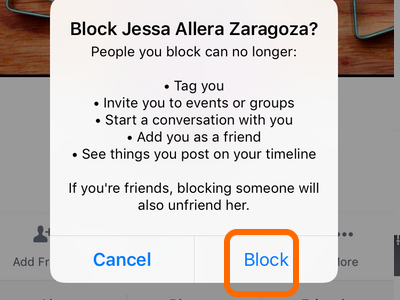 This article will guide you through the step-by-step procedures on how to block someone on Facebook. What Happens When You Block Someone on Facebook? When you block someone on Facebook, you cut all social media ties to that person. Blocking works for both users – the person who blocks and the person blocked. Once you’ve blocked someone on Facebook, that person will not be able to see any traces of you on the social networking site. He/she won’t read any of your posts and comments. If you have a common Facebook friend who posted something and you liked and commented on the post. The person that you blocked won’t be able to see your like and comment on the post. Likewise, if the person you blocked reacts and comments on your friend’s post, you won’t see any of his activities. Both of you will not also see each other’s names on posts and photos where both of you are tagged. It’s as if that you and the person you tagged do not exist in the Facebook world. The next sections will guide you on how to block someone on Facebook. 1.Log into your Facebook account using your username and password. 2.Click the drop-down menu bar on the upper-right part of your screen. 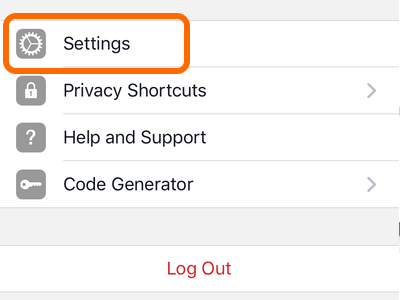 3.From the list of options in the menu, click Settings. 4.From Settings, click the Blocking tab. 5.From Blocking tab, go to the Block users section and enter the name or the email address of the person that you want to block and then click the Block button. 6.Facebook will display the possible matches of the name or email that you entered. 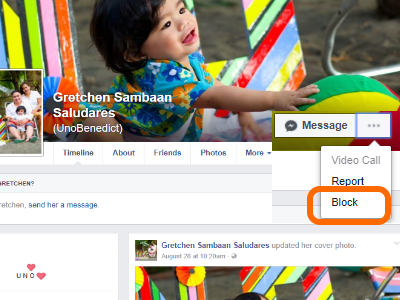 Click the Block button beside the person’s name to completely block him/her on Facebook. 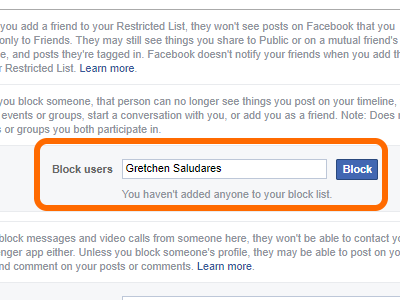 7.Facebook will ask a final confirmation from you to block the selected person on Facebook. Click the Block Username button. 8.The selected person’s name will appear on the block list. The person can no longer see your timeline, tag you, invite you to groups and events, send a message to you, nor read any of your posts and comments. The blocking works both ways. You cannot see the blocked person’s timeline or get in touch with him/her on Facebook, too. 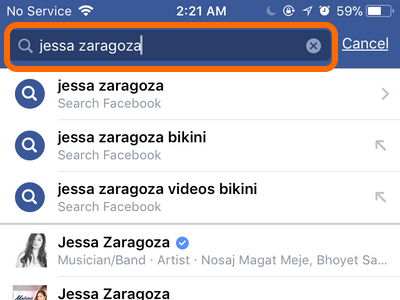 2.Type in the name of the person you want to block in the Search tab and click on the Search icon. 3.From the list of results, click the name of the target person to get to his/her timeline. 4.Check if the person is indeed the one that you want to block. Once confirmed, click the Other Options button located in the upper-right part of the person’s timeline. 5.From the drop-down options, click Block. 6.A confirmation page will pop up. Click the Confirm button to proceed with blocking. 7.You have successfully blocked the target person. His/her name will now be on your block list. 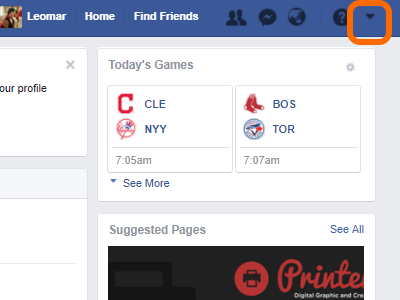 You can no longer interact with and see the person on Facebook. 1.Open the Facebook app on your iPhone or Android. 2.Tap on the Menu button. 3.From the Menu, scroll down until you get to Settings. Tap on Settings option. 5.From the Account Settings, tap the Blocking option. 6.Enter the name or the email address of the person that you want to block and then tap the Block button. 7.Facebook will display the possible matches for the name or email that you entered. 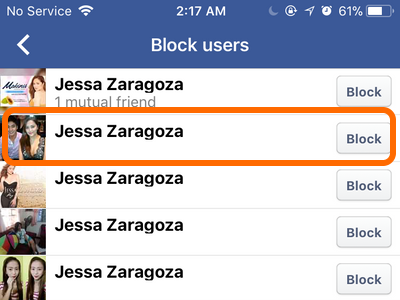 Click the Block button beside the person’s name to completely block him/her on Facebook. 8.Confirm the action by tapping on the Block button. 9.You have successfully blocked the target person using your mobile phone. His/her name will now be on your block list. You can no longer interact with and see the person on Facebook. 1.Open the Facebook app on your mobile device. 2.Tap on the Search option and enter the name of the person that you want to block. Click the Enter or Search key on your keyboard. 3.Facebook Mobile will display the possible matches. Click on the target to get to his/her timeline. 4.Check the person’s timeline to ensure that you are blocking the right person. Once confirmed, tap on the More Options button at the upper-right part of the person’s timeline. 5.Tap on Block from the pop up option. 6.A blocking confirmation notice will pop up. Tap on the Block option to proceed. 8.The target person is blocked, and his name will appear on the block list. You can no longer communicate with or see others on Facebook. Q: I followed all the steps on your tutorial, but I cannot block a particular person. What is causing this? A: Check if your internet connection is working. Actions and commands on Facebook won’t proceed without an internet connection. Also, check if you have not unblocked the person recently. After unblocking someone on Facebook, you need to wait for 48 hours before blocking that person again. Q: I’m sure that an individual is on Facebook. I want to block her. However, I can’t seem to see her on Facebook. A: The person may have already blocked you on Facebook. If this is the case, then you won’t be able to see her on Facebook so you can’t technically block her. However, since blocking on Facebook is a two-way process, it’s as if you are blocking that person since you won’t be seeing each other on the social networking site. The person may have activated the privacy options to keep hidden from non-friends and acquaintances. Q: I want to block a friend temporarily, but I’m planning to unblock her after a month. Will we remain friends on Facebook after I unblock her? A: When you block someone on Facebook, you cut all your ties with that someone. After unblocking, you need to add that person again, and she needs to confirm your friend request to be friends on Facebook again. You just learned how to block someone on Facebook using four different methods. If you have questions with any of the information on this page, let us know in the comments section. Also, since you checked on this page, these related articles may be of interest to you, too. How Do I Unblock Someone from a Facebook Group?